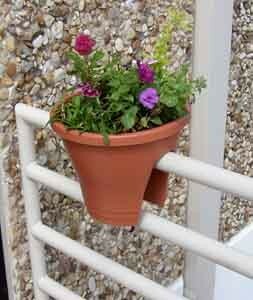 The Corsica Flower Bridge is an exciting variation on a traditional pot or a balcony planter. These planters are a great way to beautify balcony railings and fences, adding colorful flowers or herbs where plants could never grow before. The Corsica Flower Bridge actually fits on top of narrow railings, balcony railings, chain link fencing and any vertical divider up to 2.5 inches wide.Each pot has a 2-inch-deep bottom water reservoir to keep plants well watered and overflow holes to drain off excess water. Each two-pack comes with stabilizers to make sure each Corsica Flower Bridge will securely sit atop railings. Made in Holland of sturdy 100% weatherproof resin. The elegantly designed Corsica Flower Bridge is available in 9 popular colors: terra, caramel, anthracite grey, white, metallic black, metallic blue, forest green, fuchsia, and intense red. Sold in packs of two planters, both of the same color. This entry was posted in Garden Plants on February 15, 2014 by admin.